Napoleon in the Pest-House at Jaffa by Antoine-Jean Gros, Part 14 of the Introduction to Art and Artists of Our Time. From the picture by Antoine-Jean Gros. ANTOINE-JEAN GROS was the youngest member of the first family of David's pupils. He was born in Paris in 1771; his family was without fortune and he gave himself up early to the study of art. He made rapid progress under David, and after the crowning of his first work by the Academy he went to Rome to continue his studies, but the disputes between the Papal Government and the French authorities, which had already led to riots and disturbances and to the virtual breaking up of the Academy for the time being, had scattered the pupils and the teachers, and Gros was obliged to take refuge, with others of his compatriots, in one Italian city after another. Receiving no help from his family, and needing money, he took to painting miniatures in Florence and Genoa, and on the arrival of Napoleon he obtained a place in the army and fought with his countrymen. At the taking of the Bridge of Arcola, Gros was present and saw Napoleon on the memorable day when he planted the tricolor upon the bridge in face of the Austrian fire, and on his return to France he exhibited in the Salon that picture of the scene which at once made his reputation, and broke, or at least divided, the allegiance to the ideas of David, up to this time almost religiously held in France. However it may appear to our own time, when "realism," so-called, has made such strides, the picture of Gros struck the younger artists by its greater freedom of conception, its naturalness of action, the complete absence of resemblance to antique models, and in general, its modernness, as a bold innovation, and it produced an excitement and a disquiet that seem indeed almost unaccountable to us of to-day. Encouraged by Napoleon, whose vigorous common-sense made the mythological and sentimental art of the greater number of David's pupils distasteful to him, Gros painted picture after picture commemorating the victories of Napoleon, and in 1808 the emperor rewarded him for his "Battle of Eylau" by sending him, in the Salon itself, the order of the Legion of Honor which he took from his own coat, and made him at the same time a Baron of the empire. 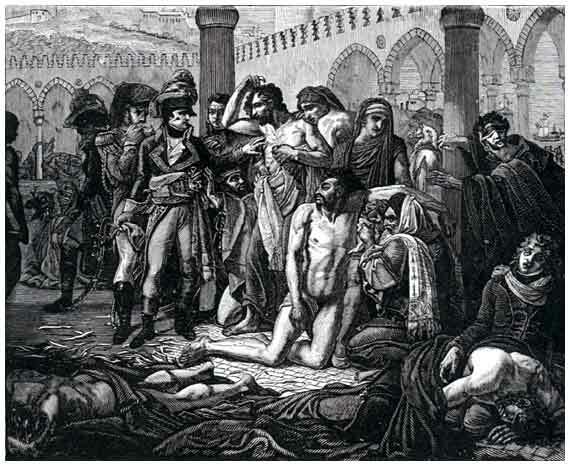 Gros's masterpiece is the "Napoleon visiting the Pest-house at Jaffa," which we engrave, and where we see the young hero showing himself, as hundreds of others not so highly placed as he, with many a sovereign beside, have done, indifferent to the fear of death, and strong in the faith inspired by their own will. It is a fact indicative of the powerful influence exerted by David on the minds of his pupils, that Gros reproached himself for the influence his own works had had in weakening the influence of his master; he made several futile attempts at painting subjects drawn from the antique. Among these was that feeble piece of sentimentality, "Sappho about to throw herself from the rock of Leucadia," once well-known from the engravings, but his efforts in this direction had no success with the public, and Gros saw that he had humbled himself in vain. After the death of Napoleon, Gros fell upon evil days; he attempted some illustrations of the restored monarchy, but they excited no interest, and were forgotten as soon as seen. Delecluze attributes a large share of the influence that Gros exercised in breaking up the school of David and in preparing the way for the Romantics, to his freer manners, his informal way of living and painting, the absence of all pedagogy in his teaching and of all attempt to impose his own practice upon his pupils. He had his studio in the vast monastery of the Capuchins lying along the Rue de la Paix and extending from the Rue des Petits Champs to the boulevards. Besides housing a great number of artists, there were several places of amusement connected with the building; among others the celebrated riding-school and circus of Franconi. Here in his studio, contrary to the habit of all the artists of his time, Gros kept, as it were, open house, painting freely in the midst of his friends and visitors, among whom were many soldiers of the army, with whom the artist jested, laughed, fenced, discussed arms and weapons, painted and talked, sang and painted, and set for the younger sort a new example that disturbed all their ideas, and broke down the walls that had hitherto kept their art a thing sacred and apart. Fully to understand the difference between the new way and the old, one should read the descriptions in Delecluze of David's studio, "The Studio of the Horatii" in the Louvre, and of that of Gros, in the Convent of the Capuchins.